Patience was rewarded at Padang Padang Thursday for the Finals of the 2018 Rip Curl Cup. After playing coy last year and withholding the world-class waves required to hold the WSL specialty event, Padang Padang returned with a vengeance in 2018, producing one of the most spectacular two days of barrels ever seen at The Rip Curl Cup. Jack Robinson was also rewarded for his patience. 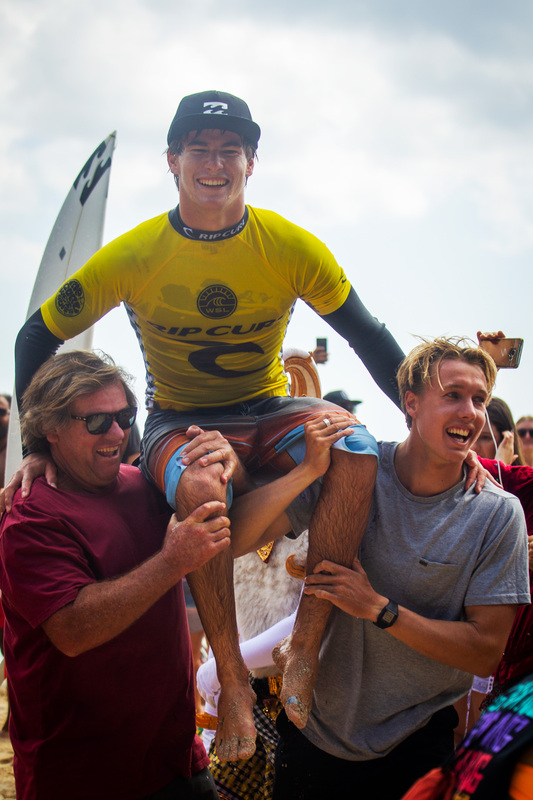 The 20-year-old barrel maestro has been invited to the Rip Curl Cup since the age of 15, but never made it to Finals Day until 2018. 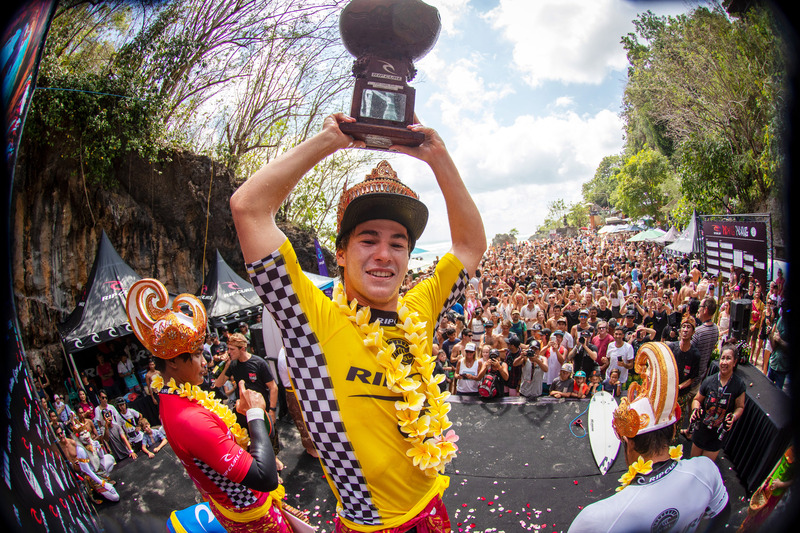 On the heaviest day at Padang in recent memory, Robinson went on a tuberiding tear, scoring three 9-point rides and a perfect 10 en route to perhaps the most impressive achievement of his young career. Robinson’s 19.90 Finals total was the highest of the event and left his fellow finalists in a combination situation they could never recover from. Uluwatu local and Trials surfer Agus Setiawan finished in second place with 17.15, followed by Bol Adi Putra (IND) with 15.75 and 2016 winner Mega Semadhi (IND) with 11.00. Several of Robinson’s double barrels on Thursday recalled Jamie O’Brien winning the Rip Curl Cup in 2009, the last time a swell this monstrous rocked Bali. After completing Rounds 1 and 2 at Padang Padang on Sunday, eight surfers remained for Thursday’s Finals Day. Things kicked off with a bang as Semifinal 1 saw more 9s and 10s than the entire two opening rounds. Spitting tube after tube roared through the Padang reef, making the judges in the tower moan with envy. Semifinal 1 belonged to the locals, as Agus Setiawan and Bol Adi Putra finished first and second, respectively, and eliminated Day 1 standout Jacob Willcox (AUS) and Brazilian tube assassin Bruno Santos. The highlight of Semifinal 1 was Bol Adi Putra’s incredible double barrel for a 9.55 that saw him soul arch through the gaping inside double-up, get spat out across the reef, emerge from the spit and ollie over the nose of a jet ski caught on the shoulder. In Semifinal 2 Jack Robinson went to work, hooking inverted backside snaps under the lip and clinging to the ceiling of several breathing Padang caves for the heat win. Nipping at his heels was defending Rip Curl Cup Champion Mega Semadhi, who also booked his ticket to the Finals. The Final featured three Padang local surfers alongside Robinson, the lone international and the lone regularfoot, sparring with the treacherous caverns on his backhand. For both Semadhi and Adi Putra it was their record fifth Rip Curl Cup Finals appearance, and both local legends were vying to become the first three-time champion in Rip Curl Cup history. In addition to the maxing swell, a slight side chop and rising tide heading into the Final added an extra degree of difficulty to emerge from the tight end section. The tricky exits would prove pivotal in the Final, as several would-be high 9s and 10s ended prematurely. In the decisive set of the Finals, Robinson snatched up the first wave and scored an impossible 9.90. All three locals followed with incredible screaming tubes of their own, but all got clipped or bucked off before finding an exit. Defending Champion and Padang local Mega Semadhi in particular had a surefire 10 but was axed by the lip. Robinson would go on to back up his 9.90 with another impossibly long ceiling climber before getting spat out in the channel. The judges had already dropped the 9.90 and had nowhere to go but up. Robinson had a perfect 10 and the field was comboed and essentially all needing two perfect 10s. The local boys continued to put up a good fight, including a 9.5 from Bol, but in the end the day belonged to the young man from WA. 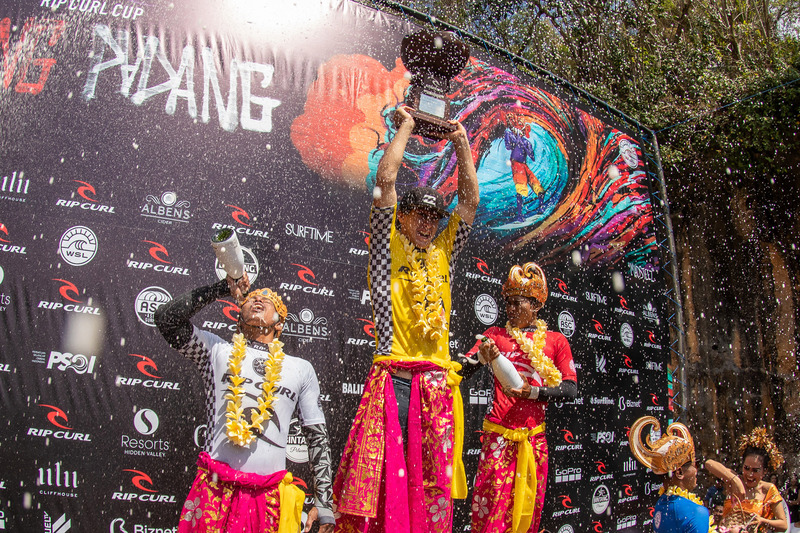 It was all smiles from all four finalists on the podium, who all knew they had just feasted on the best day of waves at Padang in years. For Robinson, a longtime annual visitor to Bali, it was just another day of trading epic waves with his Indonesian mates.